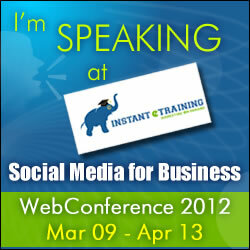 Instant eTraining's Online Social Media event gives big conference content with personalized interactive training from thought Social PR experts including Lisa Buyer. The 100% online format lets you watch (or rewatch) sessions any number of times and features 23 live online sessions and 19 social media marketing top authors and thought leaders, along with the social media certification program. Social PR specialist Lisa Buyer joins 18 social media experts including Brian Carter, Lee Odden, Krista Neher and Alan K'necht as an instructor with Instant E-Training’s Social Media for Business WebConference & Certification Program from March 9 - April 13, 2012. Registration for the eight-week workshop is open at Social Media Training site. The workshop features 23 live online sessions and 19 social media marketing top authors and thought leaders, along with the social media certification program. The online social media training workshop is aimed at corporate marketers, social media managers, job seekers, business owners, and anyone responsible for growing a business. Social Media for Business Web Conference & Certification provides an interactive learning environment through live video streaming, live chat, interactive Q&A, and over $1,000 in free bonus materials. Subscribe to Lisa Buyer’s Social PR column at Search Engine Watch and Social PR Scoops.